The typical presents that men receive on Valentine’s Day, the most romantic day of the year, say a lot about the modern relationship. If it isn’t a shirt or another addition to his wardrobe, it’s undoubtedly a watch, checkered tie, pair of cufflinks, or similar accessory for bringing his style up to date. We like our men to look good. And Valentine’s is one time of the year we can take free rein over his appearance in the name of nothing other than our deepest love. What better way to get rid of that tattered wallet or tacky plastic Casio and make him that bit more presentable to friends and family? The thing is, I think we all know clothing accessories are not the real way to a man’s heart. To give him a gift he’ll really appreciate, and that will also add to his masculinity, you need to tap into the essence of what it means to be a man: function, play, travel, experience. Even if he is secretly hoping for a new pair of skinny jeans. Give your man something he loves this Valentine’s Day (other than you) with our five affordable, unique, and truly masculine gift ideas for him. There’s few things more manly than a heavy slab of wood. The material is a sign of strength and formidability, and everything about it from its texture to its smell transports us back to nature and our roots. Still, handmade wooden furniture doesn’t excite the typical male. That is unless it is hyper-functional. This wooden wireless smartphone charging tray by Make Me Something Special is the epitome of practicality and style. Crafted from beautiful English Oak or American Black Walnut, the tray is like his official command centre: offering a convenient place to charge his phone, keep his keys and wallet, store books, and place whatever else is in his pockets. To make the charging tray that bit more special, you can also have it personally engraved with your choice of words or lettering — including cute, but still manly, heart symbols for Valentine’s. There’s no better way to tell your man to keep his Viking beard — or hint that you want him to grow one — than with the ultimate beard grooming set. They’re a symbol of patience, fortitude, and let’s face it, sheer testosterone. But the sad fact is, very few man know how to care for their beards in the proper manner. The result is often dry skin and scratchy, patchy tufts of hair that do their partners no favours. This complete beard grooming set from Bedfordshire Beard Co. includes all the essentials for growing thick, rugged, and luscious facial hair — beard oil and balm, wide tooth comb, moustache wax, mini scissors. The oils are made from quality natural ingredients, and will quickly turn his beard into a proud display and a pleasure for all the senses. If you’re both big fans of the barrel or you’re looking to commit the most selfless act you can think of this Valentine’s, then a trip to Masham and its two infamous brewery’s is most certainly in order. A small market town nestled in the Harrogate District of North Yorkshire, Masham is home to Black Sheep and Theakston’s Brewery — both known for producing some of the best bitters in the country. First, take a one hour tour of the Black Sheep brewery for less than a tenner each, and you’ll learn about its history, the beer making process, and most importantly, get to sample such smooth brews as Best Bitter and Golden Sheep. Later, hobble over to Theakston’s for an even easier-on-the-pocket tour and richer lesson in the history and art of brewing. Founded in 1827, it is one of the few remaining traditional family-run breweries in the UK. And with bold bevvies like Peculiar IPA and Masham Ale, one of the most popular, too. Make a weekend of it with a stay over in the one of the numerous romantic cottages and guest houses in the area. The Escape Room is somewhat of a recent phenomenon that combines physical adventure and puzzle solving with sheer frustration, explosive cursing, and occasional violent outbursts. If you want to test how strong your relationship or man is this Valentine’s, this one is for you. You won’t struggle to find a challenging Escape Room in your area, but if you’re looking for a particularly stimulating two-person bonding experience, head to Generation 1 of The Great Escape Game in Sheffield. With four games to choose from, you can choose to try and escape Alcatraz during a prison-wide riot, solve mind-boggling puzzles during a secret government psychedelics test, be involved in a life-or-death homicide mission — where it’s your life that’s at stake — or play a mad-scientist that has less than an hour to save the world before becoming a research guinea pig. The only thing is to remember is it was his gift, so leave it up to him to save you. Is your idea of Valentine’s more a candle-lit meal, curling up with a movie, and having a quiet — or not so quiet — night in? 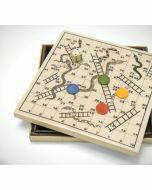 Then why not add a dash of nostalgia and childish frivolity with the classic game that never fails to bring a smile to someone’s face, Snakes and Ladders. Lots of us grew up with this old Indian board game, challenging our friends and siblings to a race to the finish while navigating the virtues (ladders) and vices (snakes) of life. It’s a simple thrill that teaches us basic lessons of morality and the unravelling story of destiny. And, if I remember rightly, is also an ancient tool for deciding who gets to do the washing up. This stunning representation of the game is crafted from solid wood and sits nicely on any coffee or bedside table — or anywhere it’s out the way of the kids and can be used for more pressing matters. After all, it is Valentine’s.